The Lavaman Keiki Beach Dash at Anaeho‘omalu Bay in Waikoloa. The day featured this run then later had the kids swimming and running in the Lavaman Youth Duathlon. I’m not sure what the difference between a duathlon and biathlon is and when I asked several folks they thought I was refering to the biathlon in the Winter Olympics, which I believe is cross-country skiing and rife shooting. 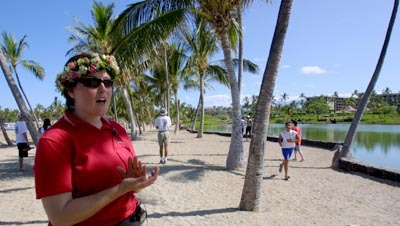 Here LabGal Laura Dierenfield cheers on the keiki athletes as they make their laps around one of the ponds at Anaeho‘omalu Bay (A-Bay to many folks here). Laura worked hard behind the scenes on this event to organize things and get some cool stuff for kids, mahalo also goes out to Lokelani McMichael for the Nike connection for stuff. Tomorrow is the big race for the Lavaman Triathlon. So stay tuned as I may be adding some cellphone photos during the race. Gotta get some sleep now to wake-up for the early start at 7:30a.m.